Stan and Charmaine are a married couple trying to stay afloat in the midst of an economic and social collapse. Job loss has forced them to live in their car, leaving them vulnerable to roving gangs. They desperately need to turn their situation around and fast. The Positron Project in the town of Consilience seems to be the answer to their prayers. No one is unemployed and everyone gets a comfortable, clean house to live in . . . for six months out of the year. On alternating months, residents of Consilience must leave their homes and function as inmates in the Positron prison system. Once their month of service in the prison is completed, they can return to their “civilian” homes. Disclosure: I received a complimentary copy of this book from Edelweiss, in exchange for an honest review. What differentiates a Margaret Atwood-esque speculative fiction than the crop of many science fiction, fantasy, dystopian stories that practically saturate our markets? Well, as with this newest speculative fiction story The Heart Goes Last, formerly a series of smaller, more episodic novellas under the banner of “The Positron Project,” Margaret Atwood’s style of speculative fiction is ostensibly absurdest and zany, though also rather dark, dreary, disconcerting, disturbing at times, and deeply meaningful in the most discrete of ways. One moment, you’ll be chuckling heartily at some insanely clever pun or euphemism on one page, or some ribald joke on another, and then another you’ll be left in a state of temporary despondence, over a shocking revelation about the state of modern society that would even make Charles Dickens, one of the foremost, accidental pioneers of dystopian fiction, fairly shocked. Back in the nineteenth century, Charles Dickens published a novel called Hard Times that scathingly criticizes the industrial revolution and its consequent reductive effect on the value of human life itself, in a more artful or philosophical sense. Underneath the lugubrious descriptions of the implacably, fog-ridden London,and the squalid conditions of the houses of the poor, lay a lucid, though rather dreary revelation of the decrepitude of human society that ironically works in the opposite fashion than the supposed forward, machine-like progression of the industrial machine. After that, the mechanized machine soon became eugenics, cyborgs, robots, as our technology rapidly advanced, thus advancing the aesthetic of our collective dystopian nightmare. The whole concept of Hard Times was just that. To those in power and economic prosperity, it is a Utopian scheme, but from the collective perspective of those being enslaved by the anti-Marxist monstrosity; it is a dystopian scenario, because the only thing utopia brings is grudging complacent feelings among the larger numbers of the poor, or lower middle class. On the other hand, the rich practically luxuriate themselves with this false acceptance of their complacent acceptance of their propagandized messages of the industrial revolution being ultimately preferable to whatever they had previously, in the near past, but not the distant past. How does any of this rather long-winded analysis fit in with the dreary future Margaret Atwood envisions in this novel, The Heart Goes Last? 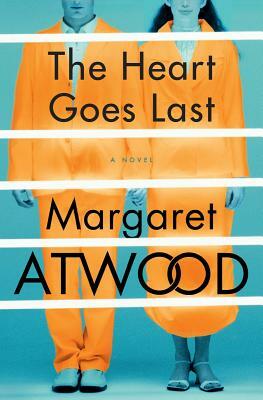 Well, I have to say that as uncanny as many elements of this story appear to the unwitting reader; Margaret Atwood actually reveals herself in this novel as being disturbingly prescient with her seemingly deep knowledge and understanding of the sociological and philosophical questions about our future society. Both lead characters, who are standard middle class workers, are average characters, ordinary in the sense of their economic level, and weirdly not-so abnormal with the deeper thoughts they have throughout the story. Margaret Atwood, even when being terribly sardonic in tone, is also extremely perceptive and realistic, when it comes to describing the psychological processes of human beings-our wants, needs, and base desires, and how economic policy-makers can use these to their advantage, when unconsciously retooling how we think and manipulating our most stereotypical wants and needs, to get us to be caught unawares by our collective Utopian desires. Both Stan and Charmaine, our lead ordinary characters with more unconventional thought processes, are both persuaded by the propaganda promulgated by the Positrion Project, who convinces them that this new sociological model of a society divided into a middle-class, fifties era, white picket fence neighborhood, alongside a prison, can finally deal with the excesses of human behavior, and allow those in the middle-class suffering a lost opportunity for jobs mostly due to overpopulation, a chance to finally feel secure. Margaret Atwood wisely makes sure to show that it is mostly younger couples, being greatly persuaded by these commercials, promising economic security, and a chance to live the American Dream. Perceptively, Margaret Atwood seems to greatly understand the worst dilemma plaguing America and Canada at this time, and that is the sheer challenge that younger college graduates are having with finding meaningful full-time job opportunities post-college, and the most overt sign of an economy in decline is one where the younger demographic is having trouble with achieving economic stability. From my experience for the past two years, I can attest this is the new reality that very few people wish to speak about, but it happening. One could look at the way statistics on unemployment are altered for political reasons, being something this book speaks about in that we’re never being given the complete, unaltered truth. Rather, we are giving something distorted, in that the one thing that this data fails to represent is the vast number of individuals my age have simply forfeited the endless drudgery and hopelessness inherent to today’s job search. In today’s world where all the odds are beset against us,seeking a job is a goal that has gone far afield, and I think most readers my age will identify with the predicament these characters face, their futility towards the beginning in particular, as we are depressingly powerless in the face of economic complications. We are all Stan and Charmaine, and these characters will appear very relatable to anyone in their twenties and thirties, having to try for a long stretch of time, even to just attain a part-time, entry-level position. For some inexplicable reason, our economy is leveled against us, and this is something many first world countries are grappling with at this time, as the baby boomer generation retires and languishes in overpriced retirement homes,incredulous over the absurd reality that their children and grandchildren are having so much trouble getting jobs. Little subtle bits in this novel, like Charmaine’s recurrent references to her grandmother’s aphorisms, speaks to the way that our memories become increasingly more false and sterile over the years, that nostalgic things become more kitsch and cloying, because in the midst of despairing odds of the present, we revert to a beholden view of a false narrative of the past being more secure and less problematic than the present. And this is what corporate and institutional powers use to their advantage, especially in times of economic regression. It’s something all the great dystopian writers, like Margaret Atwood, are sensible and perceptive enough to understand all too well. And a bulk of this novel speaks to the dangers of idealizing the past, or making safe decisions all in the name of fleeting, false security/stability, even if it means metaphorically selling your soul to a system, or structure of sorts. Our present life in the modern world is indeed a very disillusioning structure ripe with saccharine commercialism, and this story acts as a cautionary tale about how we should still not enfeeble our minds into such a state of desperateness that we forswore any of our democratic rights of liberty and free choice, that is not meddled by the false narratives of the propaganda spread by the corporate elites. In the novel, the inhabitants of the positron project lives one month in a prison and the other month in the pristine, fifties-era community, modeling to ourselves the binary of the 99%; you either live in a state of easy contentment, or one of complete subservience to the whole system itself, all the while buying cheap, manufactured kitsch commodities to fill your uniform house with, as you try to distract your mind from becoming too unseated in despair over the complete vapidness, middling existence that you are enslaved to. Greater powers and authorities lie out there, influencing all your decisions, all because they have been almost predestined to achieve power through inherited money, and this all models the core, uncomfortable message at the heart of Charles Dicken’s Hard Times, though this novel delivers that same message within the form of a extremely smart, often dark, though strangely humorous speculative fiction novel that really confronts our hidden vexations with the moribund system that we currently inhabit, which we all know can no longer sustain us, yet we seem to enslave our minds nonetheless to choose contentment over the more empowering, though isolated choice of choosing things more individualistically, to have more power and voice with how things are maintained and run within our society. Cleverly, The Heart Goes Last is a brilliantly uncomfortable read that will challenge you to maintain your democratic powers, in the midst of more powerful corporal influences that we are inundated with on a daily basis. Both this novel and Dicken’s Hard Times all derive their core philosophical messages from Socrate’s “Cave” allegory. In both novels, characters must drudge themselves through the bleak emptiness of a cave-like life, deprived of joy, thoughtfulness, and edification, and as such, they are fettered to this, even though they know deep-down their extreme dissatisfaction with all of it. Yet the self-imposed prison of loathing is not the same as recognizing our enslavement, and then liberating our minds from what ever tethers us, restrains us from really thinking about things deeply, like the meaning of love and life; all of these things that are subdued by greater powers and pressures, perhaps like religious institutions, corporations, and the like, who have subtly ingrained the belief in our minds that power is held by those with great capital, versus the many people that must remain complacent and work within the system, or else, they’ll be removed by those who really hold the power. The one thing that remains intractable and stubbornly immutable is this grandiose hierarchical structure, and only very few writers like Margaret Atwood and David Mitchell have had the wherewithal and clear sightedness to speak on this ailment of the post-modern era. To be fair, there are moments where the story doesn’t always work, where things become perhaps a little too preposterous and campy, to be taken entirely serious. The story is best with dealing with the psychological concept of freedom, and the paradoxes that that exist with respects to the continuous power struggle we have face on a daily basis, between the pressures of the directives of the economic model of society we inhabit, against what we truly feel at our core. And the system works best, from the perspective of those with power, when it understand the paradoxical nature of humanity, and utilizes it for the perfection of tight-knit conformity within their model society. Amidst all the zaniness, The Heart Goes Last is an eye-opening, brilliant, and sometimes uncomfortable read that will unseat your mind from thinking in a linear fashion in concordance with the meta-narratives fabricated by whatever authority lies behind the system we’re imprisoned in. Like Handmaid’s Tale, The Heart Goes Last is the type of smartly-written speculative fiction that acts as new commentary on the age-old Plato’s Cave allegory, but in such a way that it feels extremely relevant to the state of our lives now.